Watkins - Providing the best products since 1868 ! 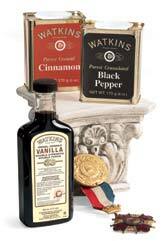 Before there was a pharmacy on every corner, or a gourmet shop in every town, there were Watkins products. Starting back in 1868, Watkins purveyed the only health "remedies" that came with a money-back guarantee. That guarantee still remains, along with a reputation for using only the finest natural ingredients. Visit our Watkins Catalog today for more information on Watkins Products!. While most famous for award-winning Vanilla and spices, Watkins today offers a complete line of gourmet specialty foods, botanical personal-and home-care products, elegant gift baskets and - of course - tried and true medicinals. Watkins products have been used for over 130 years and just the thought of those products brings warm memories. Today, Watkins still supplies the basics for everyday life as well as those little indulgences that help make it more enjoyable. When you taste one of Watkins spices or unique sauces, treat yourself to one of our skin-softening elixirs, apply one of their famous salves to a cut or burn, or see yourself in the shine of a freshly-cleaned bathroom fixture, you'll appreciate the 135 years of experience and integrity that goes into each one of Watkins products. Watkins money-back guarantee that made Watkins a household name all those years ago still exists today.